In a note to investors provided to AppleInsider, analysts at JP Morgan have continued to hold their expectations about Apple from their February note. Again, the poor growth of iPhone is a major point of the note, with suppliers continuing to see underwhelming results compared to previous years. Aggregate revenues for suppliers in JP Morgan's tracker declined 1 percent year-on-year in the first two months of the year, a drastic change from the 7 percent growth seen in the fourth quarter of 2018. For comparison, the same periods in 2018 and 2017 witnessed growth of 13 percent and 4 percent respectively. While trends are potentially being distorted by the timing of the Chinese New Year, it is said that the month-to-month revenue decline fo 34 percent from January into February is a bit of a jump from the 23 percent decline usually seen, as well as being an increase from the 24 percent cut from December to January. In terms of iPhone shipments, JP Morgan cites an IHS forecast of a 5 percent decline for 2019, on top of another 5 percent decline for the full year 2018. Shipments for Q4 2018 went down 17 percent, with the forecast for the first through third quarters trimmed by 10 percent, 7 percent, and 3 percent respectively. Current IHS expectations is for Apple to ship 195 million units for all of 2019, with year-on-year growth anticipated in the fourth quarter by 7 percent. JP Morgan's own shipment forecast is being maintained at 185 million units, with analysts acknowledging the firm's pessimism. On a model basis, the iPhone XR is believed to have accounted for over one third of shipments in the fourth quarter, accounting for 23.1 million units, or 38 percent. 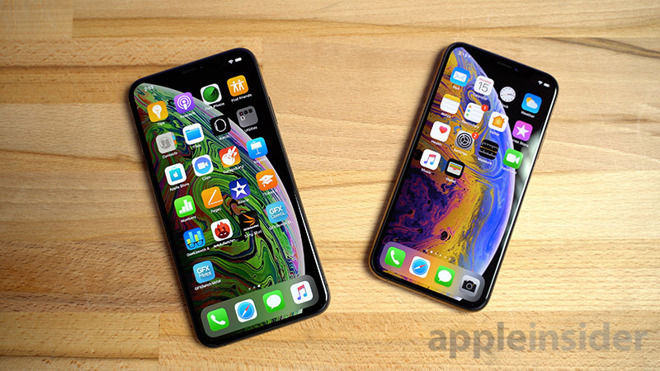 The iPhone XS Mac and XS reached 13.6 million and 8.7 million respectively according to IHS estimates, making up 21 percent and 14 percent of the total, while the iPhone 8 Plus and iPhone SE made the bulk of the remainder, at 6.1 million and 9 percent for the iPhone 8 Plus, 3.9 million and 6 percent for the iPhone SE. The latest generation of iPhones is said to make up 71 percent of total iPhone shipments, which is a small drop from the 77 percent observed for the fourth quarter of 2017 and 76 percent for the same quarter in 2016. Blended iPhone average selling prices are up, however, rising 2 percent year-on-year to $809 in the fourth quarter. JP Morgan's China Technology analyst Billy Feng believes Apple's problems in China aren't going to be rectified for a while, with "better-than-expected smartphone sell-through during the Chinese New Year" being a good sign, but not enough for the supply chain. "Suppliers remained cautious about 2019 smartphone demand, with a 10 percent unit decline expected for the China market year-on-year."